Are you wondering how to use QR codes to enhance your marketing? Keep reading to learn some tips for implementing 5 essential steps. QR and other two-dimensional (2D) codes can be readily integrated into your current business marketing practices to bring your online content to a mobile audience in real time. In North America, QR and 2D codes are still a novelty. For this reason, early adopters are eagerly putting them into practice to get to market first and capitalize on the trend. As a result, some embarrassing and costly mistakes are being made. This article will help you learn from those mistakes and develop best practices for creating a favorable user experience that serves both you and your community well. To create a successful QR code campaign, it is essential to understand your target audience, have clear objectives and provide useful and valuable incentives to deliver a favorable user experience. Here are some ideas and considerations to help you get started building your strategy. Does he/she need instructions about the use of QR codes? Does he/she need to use a specific type of code reader? Will the codes be scanned indoors or outside? Are you trying to grow your email list or get more Likes for your Facebook page? Then you should always provide an incentive, especially when using scannable codes. As more businesses fail to deliver value with their QR code campaigns, consumers in general will become more reluctant to scan them in the future. This will make it increasingly necessary to provide clear incentives and deliver on them. While there are numerous 2D code formats, the two most commonly used worldwide are QR codes and Microsoft (MS) tags. Both technologies are free, so your choice of which to use will largely depend upon your audience and other market factors. A customized MS tag for IAMS pet products. 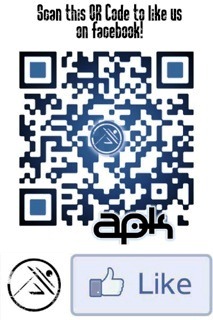 A customized QR code by Patrick Donnelly of 2ergo for American Parkour. The owners of the QR code technology have elected to allow anyone free use of it. This gives QR codes the advantage of being in mainstream use around the world, and that awareness is currently working to their advantage. The MS tag technology is proprietary, which allows for complete control over the entire user experience of generating, reading and tracking the tags. MS tags are also easily customized. One can embed images or logos into the codes using Microsoft PowerPoint. The widespread use of the QR technology has attracted lots of developers who want to cash in on the trend. However, when technologies are open like this, there is always the risk that generally accepted standards will not be followed. QR code generators and scanners are only as good as the developers creating them, so you have to do your due diligence. What happens if your QR codes do not work? For one thing, your reputation and brand are tarnished—just as it would be if a visitor to your website discovered multiple broken links. I recently discovered one particular situation where a small business used QR codes in print ads in an annual publication. After trying several scanners, I could not get any of the QR codes to register. The investment of thousands of dollars on those print ads that will be in the market for a year was a costly mistake for that merchant. The lesson from this is clear—test your codes. Test your QR codes with multiple readers and devices. Use link shorteners to create clean codes. Avoid using colors that do not provide sufficient contrast—a potential problem with both QR codes and customized MS tags. Make your codes at least 1″ x 1″—larger is better. Provide a sufficient quiet zone around the code. Avoid using 2D codes on highly reflective surfaces. Consider where your codes will be scanned. One unfortunate application was in the New York City subway where there is not an Internet connection. Use a quality QR code generator. My favorite is Kerem Erkan. Use a quality scanner or reader. Two excellent choices are Qrafter and i-nigma. 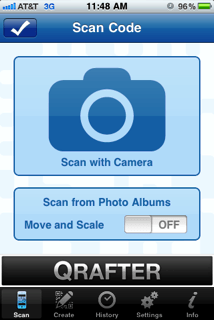 Qrafter is unique in that it is both a code generator and scanner in one app. Qrafter is a multi-feature QR code generator and reader. The most common mistake marketers make with QR codes is having them resolve to a standard web page that is not mobile-friendly. Worse yet is to have a code connect to a site with Flash video, which is not supported by the iOS devices (iPhones and iPads) that account for nearly 50% of the code readers in the world. At a minimum, the page your code connects to should be mobile-friendly. For example, one of my codes resolves to the speaking page on my WordPress blog. A couple of taps on my iPhone enlarges it to fit nicely to my screen. Mobile-optimized is better than mobile-friendly. According to Matthew Gallizzi of NotixTech, mobile sites are websites optimized specifically for smartphones. He suggests hosting these mobile sites on a subdomain or subdirectory of your main website, thereby giving you the SEO benefit of the traffic they bring. Build your site around the desired user experience. Smaller images and solid colors load more quickly. Size your links and buttons to be touch-friendly. Use concise copy—sentences rather than paragraphs. Use “fluid width” for horizontal and vertical orientation. Test, test and test again—on iPhone, Android and Blackberry platforms. 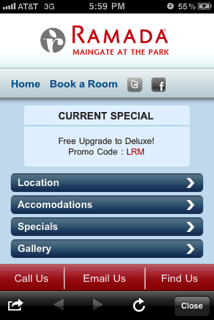 This mobile-optimized site emphasizes incentives. Three unique mobile sites featuring specific optimized content and actions. The primary benefit of 2D codes is encouraging action. This can be accomplished by connecting to multimedia content such as video that shows a product or service in action. Other logical actions include activating a phone call or social share. Links to Yelp, Flickr and other mobile-optimized sites. Links to YouTube and Vimeo (both mobile-optimized). 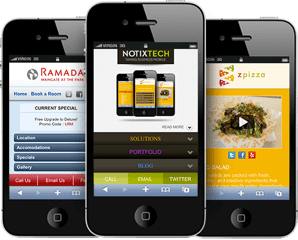 The cost of building a mobile-optimized site is comparable to a professionally designed and built WordPress site. If you are not ready to make that investment, there are a couple of services that allow you to create mobile sites hosted on their platforms: ShareSquare and Qraffiticodes. 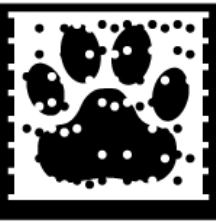 QR codes and MS tags can presently track basic data, such as number of scans, with codes generated with bit.ly being just one example. However, if you use a QR code management system, you can gather even richer data. Most of these services are free for limited used, with Delivr being one that presently offers an uncomplicated experience. 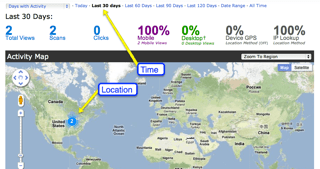 Delivr provides a variety of analytics, including scans by location and time. According to Nick Martin of Microsoft, “MS tags have the capability to accurately determine the location of a scan and report that data in real time.” This creates a number of code management opportunities, such as delivering different content depending upon the location of the scan—directions to the store or a discount coupon for those in or near the store. Will QR codes gain more widespread use? When it comes to technology, or just about anything else, there will always be naysayers. What is most relevant is that you as the marketer are the one who gives your codes value. They are just tools, and how you use the tool determines the value derived from it. QR codes can serve a specific use for you, mostly as a lead generation tool. How are you doing your lead generation now? If you can use what is working for you now and make it better, more attractive or easier with QR codes, you are probably on the right track. The video below shows how an ingenious use of QR codes helped a business in Korea to expand, and it all started with understanding the customers and building a QR code campaign strategy around their buying behaviors. Ready to implement your QR Codes into your corporate collateral, website and marketing? Give us a call 781-938-3866 or email and we can get started today!